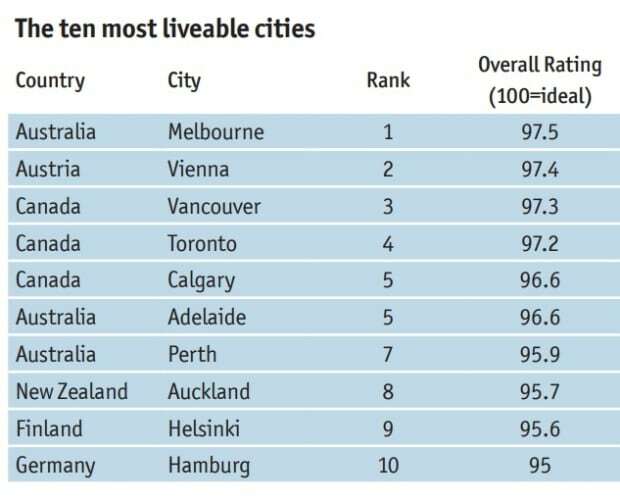 Calgary is still the fifth-most liveable city in the world, according to The Economist. The international magazine’s annual Global Liveability Report for 2017 gave Calgary a score of 96.6 out of 100, maintaining its rank from the previous year on the list of 140 major cities that are evaluated annually. That put Calgary just behind Toronto, just ahead of Perth, Australia, and tied with Adelaide, Australia. The annual report evaluates how comfortable city life is based on more than 30 qualitative and quantitative factors that fall into five broad categories. Calgary scored perfect marks (100 out of 100) in three of those categories: stability, health care and education. It also scored a relatively high 96.4 for infrastructure but lagged a bit on culture and environment, where it scored an 89.1. Stability and culture and environment carry a higher ranking than the other categories, together making up 50 per cent of the overall score. Health care and infrastructure each make up 20 per cent of the overall score, and education makes up 10 per cent. “Those that score best tend to be mid-sized cities in wealthier countries with a relatively low population density,” the 2017 report reads. The world’s largest metropolitan areas tend to be “victims of their own success” when it comes to liveability, the report adds.